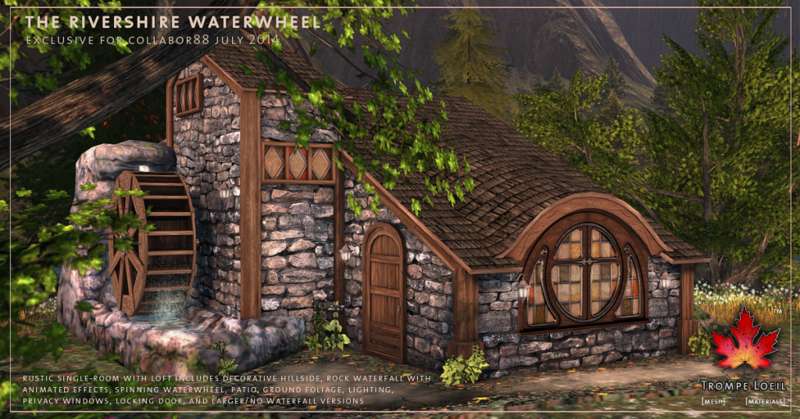 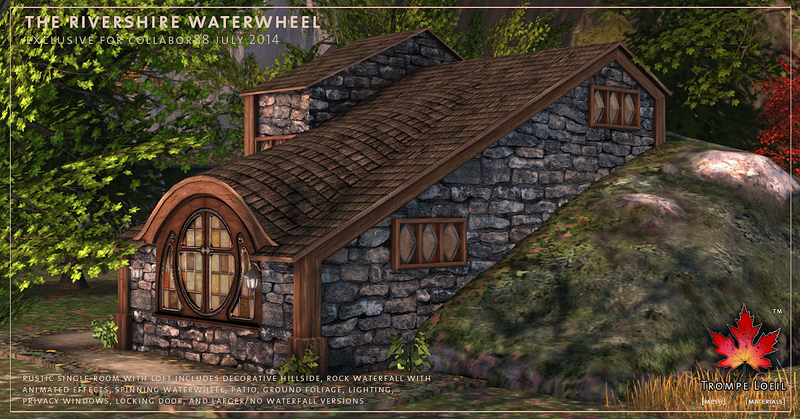 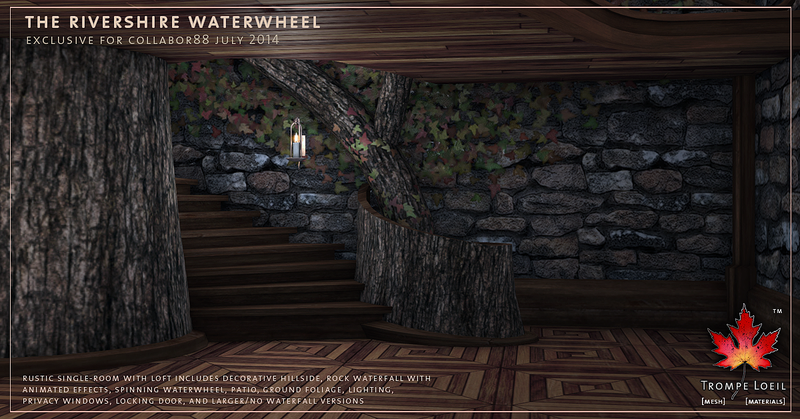 Get back to nature with this month’s Collabor88 prefab – the rustic and completely charming Rivershire Waterwheel! 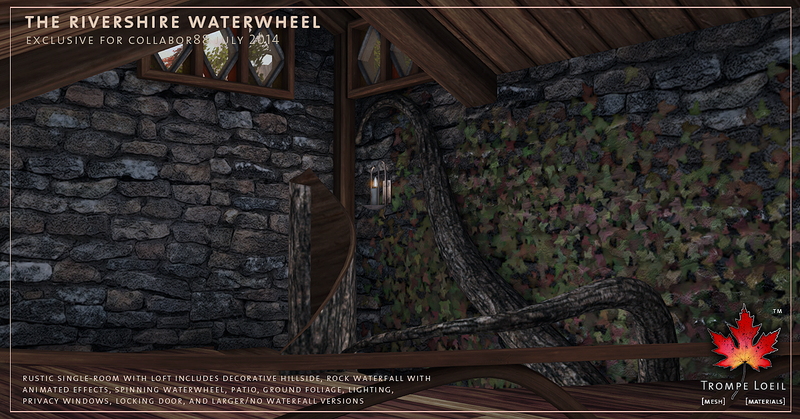 This complete scene features a handpainted patio with foliage, and the build nestles into a decorative hillside with grass and rocks, plus a stone waterfall with custom animated water effects, which powers the spinning wooden waterwheel! 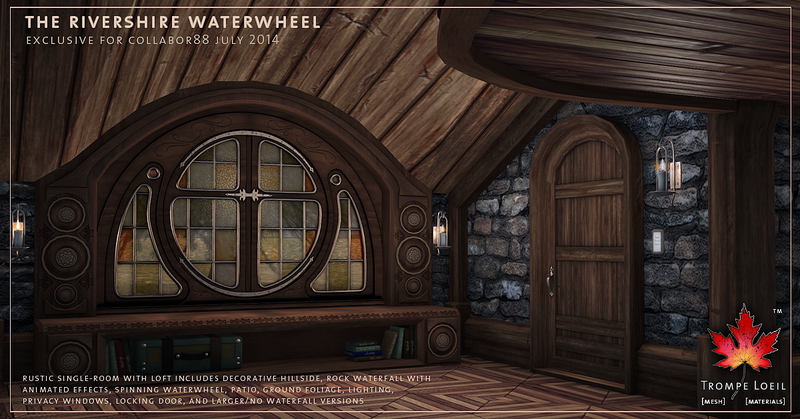 Inside you’ll find an enormous ornate stained glass picture window with built-in framework and bottom shelf. 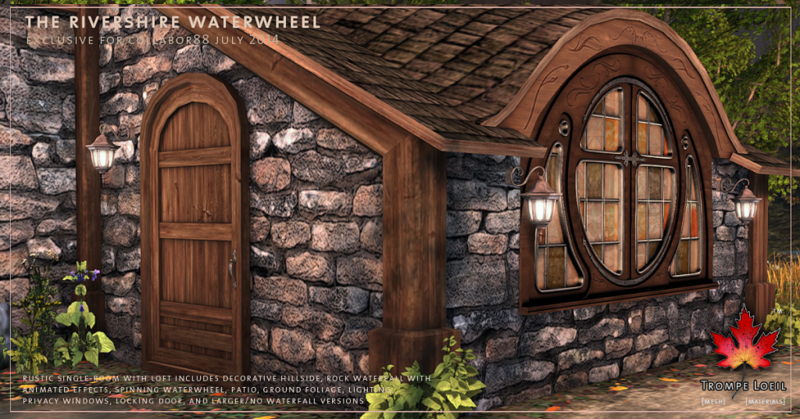 Up the stairs (right by the treetrunk along the back wall), there’s a cozy half-loft for your favorite reading chair or single-sized bed. 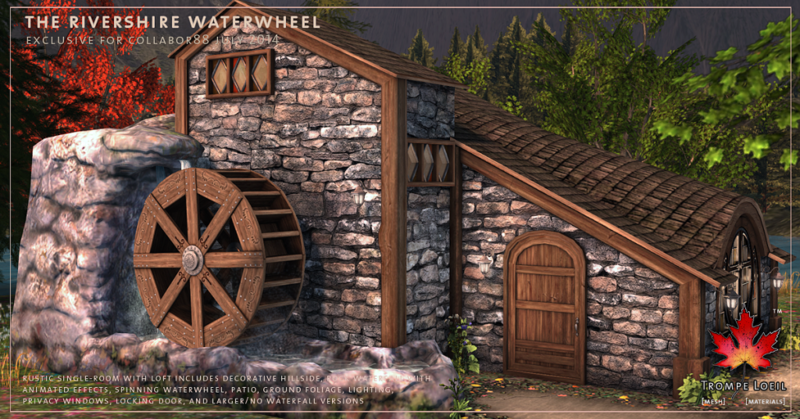 The Rivershire Waterwheel also includes interior and exterior lighting, privacy windows, and lockable door all powered by our *home control system. 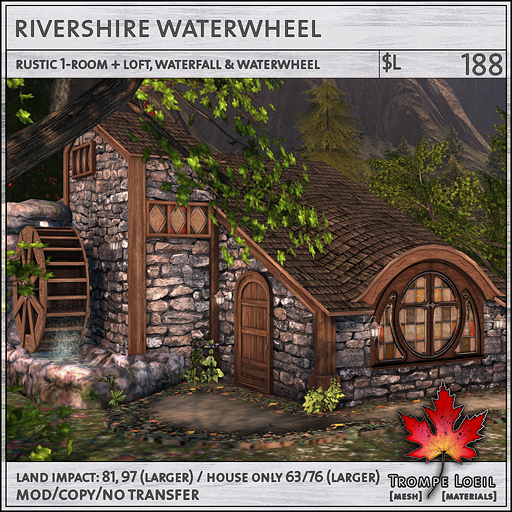 For extra flexibility, we’ve also included a scaled-up larger version for taller avatars, plus a build-only version (without the hillside, waterfall and waterwheel) in both sizes for a LI savings! Make sure to grab the perfect addition to your Waterwheel – the matching Rivershire Chair, which includes PG singles and couples poses, 4 leather colors and 4 pillow textures, plus the full permission pillow AO map so you can make your own custom pillow textures! 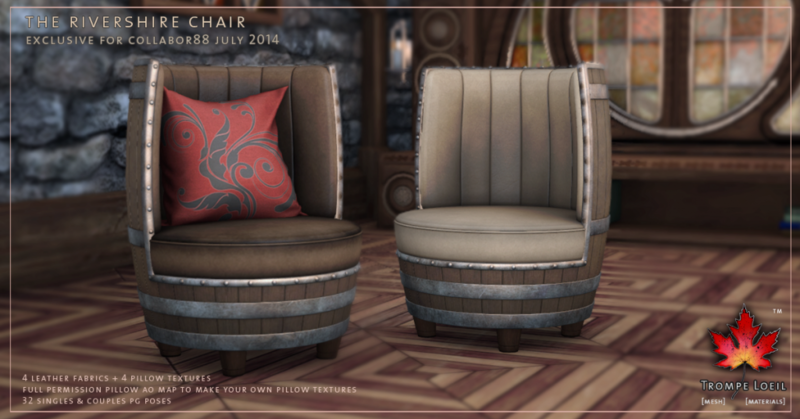 Only $L88 during the month of July at Collabor88! 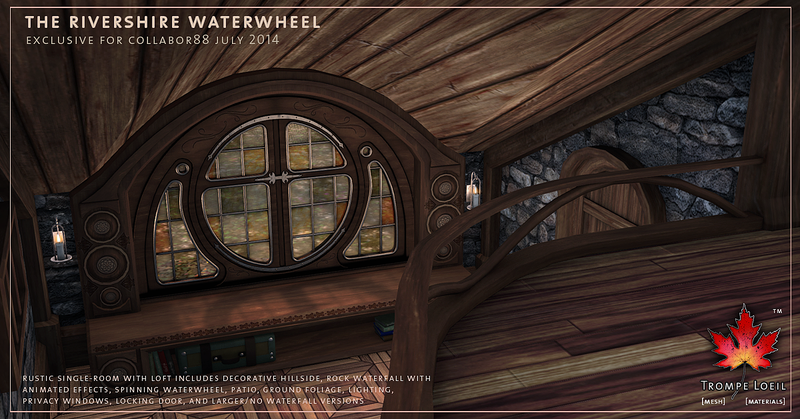 Exclusively available for the month of July at an incredible sale price, only at Collabor88!